When you are missing teeth, suddenly simple tasks such as eating and speaking become more difficult. Your appearance is also affected, and you may become self-conscious. A dental bridge is one option to replace missing teeth, but before you can have one placed, you must first have a consultation with your dentist. Here is what you should expect. A bridge is a prosthetic dental device, frequently made from ceramic, meant to replace one to three teeth. The bridge acts like your natural teeth would, and restores your smile as well as your ability to eat and speak properly. Before you can get a bridge, your dentist will need to determine if you are a good candidate. A thorough exam of your mouth will be completed. You will also most likely have X-rays done. 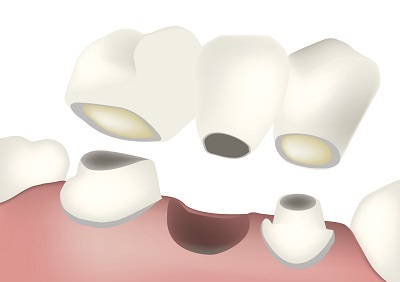 The ideal candidate for a bridge will be missing one to three consecutive teeth. Ideally you should have a strong, healthy tooth on both sides of the gap, which provide a strong support for the bridge. • Fixed bridge. A traditional fixed bridge is held in place by two crowns, which anchor the bridge to your surrounding teeth. • Maryland bridge. This type of bridge anchors to your surrounding teeth by means of metal "wings." • Implant supported bridge. An implant supported bridge is supported by titanium implants that are surgically placed into your jawbone. The implants then act like the roots of your teeth. Finally, your dentist will go over the procedure with you, what you can expect on the day of the procedure as well as what you should do while you wait for your permanent bridge to be fabricated. If you have chosen implants, you will discuss what the healing process is going to be like. And then you will learn about what happens the day you go back for your permanent bridge. Dental bridges are a great option for replacing a few consecutive missing teeth. To set up your consultation, and learn if you are a candidate, contact our office today.